A fabulous top floor 2 bedroom town centre apartment with views across Tavira and the famous Ria Gilao that runs through the centre of the City. With modern facilities, including wifi and air conditioning. Apartment Vista Gilao is a superb 2 bedroom 1st floor town centre apartment right in the heart of the old Roman City of Tavira. 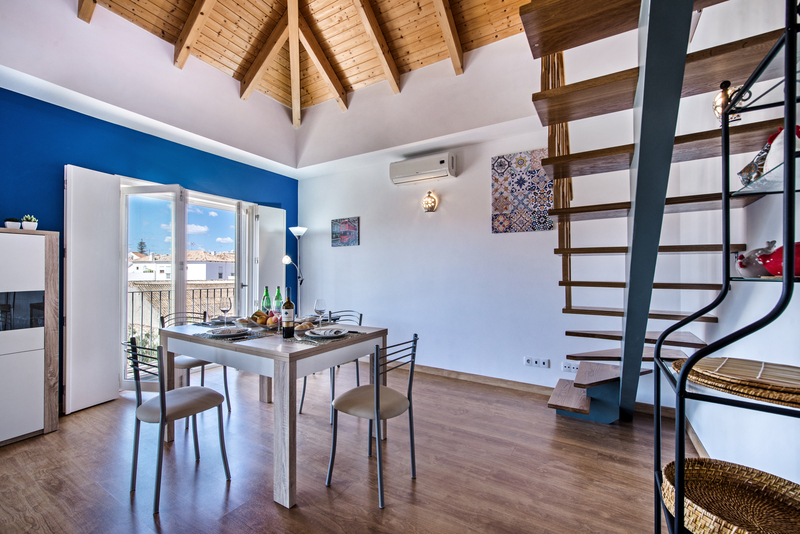 The location of this 2 bedroom apartment is simply perfect for an easy relaxing holiday. Being centrally located everything you need is within very easy reach. This 2 bedroom town centre apartment is located at 1st floor level and only 1 of 2 apartments in the building. 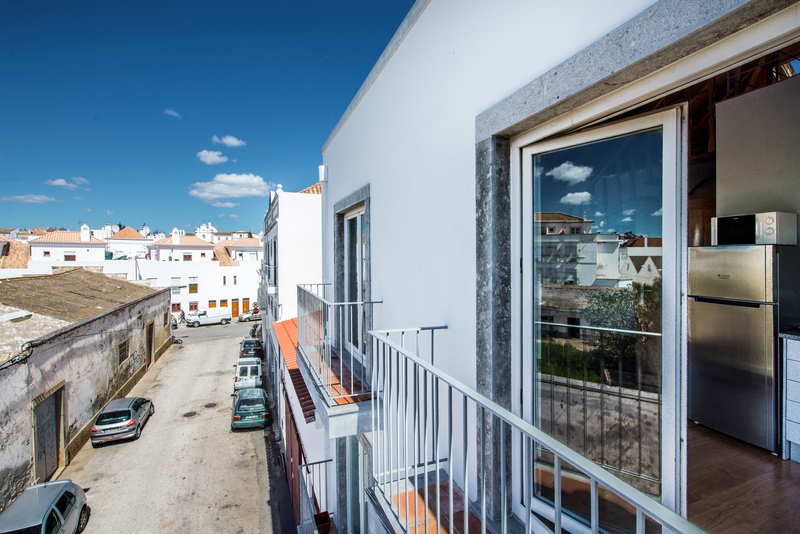 Situated on an old side road in a terrace of properties the area is quiet but close to the centre of Tavira. Upon entering the front door to the building from the street, steps take you to the top floor where you will find the private door to our apartment Vista Gilao. Traditional tiles on the walls and marble floors in the communal hallway and stairs remind you that you have entered a traditional old Portuguese building and add to the authenticity of this wonderful place. The main apartment front door opens up into a large and light living space flooded with natural light from the 2 sets of french windows to the front of the living room. In the centre of the living space is a smart modern light wood and white dining table with 4 chairs. Between the terrace windows is a cabinet that matches the dining table full of glasses and dining items for your use. The living space in the 2 bedroom town centre apartment offers plenty of space and light especially as it benefits from an amazing high ceiling alcove in gorgeous warm wood. It works in 2 ways in assisting to keep the 2 bedroom town centre apartment nice and cool in the hot summer months but also offers a sense of warmth during the colder winter months. The most amazing feature of the spilt level living space of our 2 bedroom town centre apartment is a large french windows that open up on to 2 small Juliet balconies. They both offer a lovely and natural cool breeze when open but also have wonderful solid shutters to keep the place cool and dark whilst you are you sightseeing in the summer. Painted white against a dark blue contrasting wall the effect makes for the really lovely feel to the room. 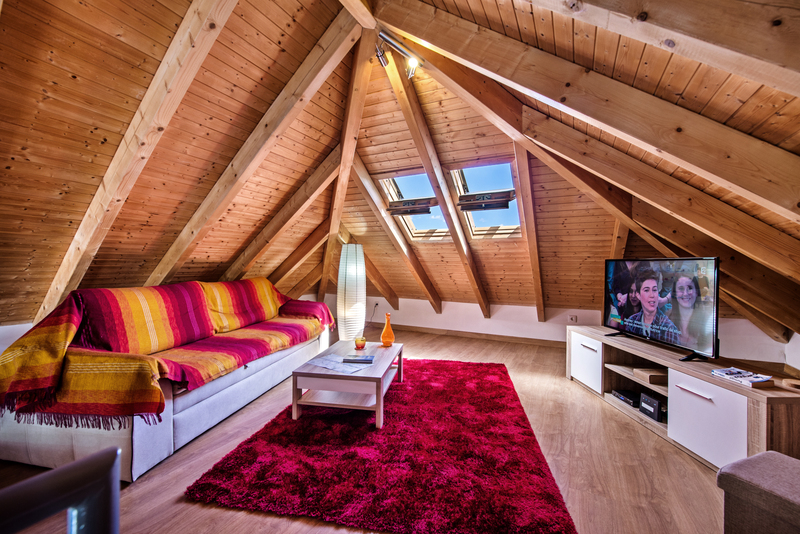 The walls are decorated with typical Portugal themed pictures to add colour and style to the room. Situated on the far wall is an effective and modern air conditioning unit that offer either warm or cool air depending on the time of year you choose to stay in this great 2 bedroom town centre apartment. 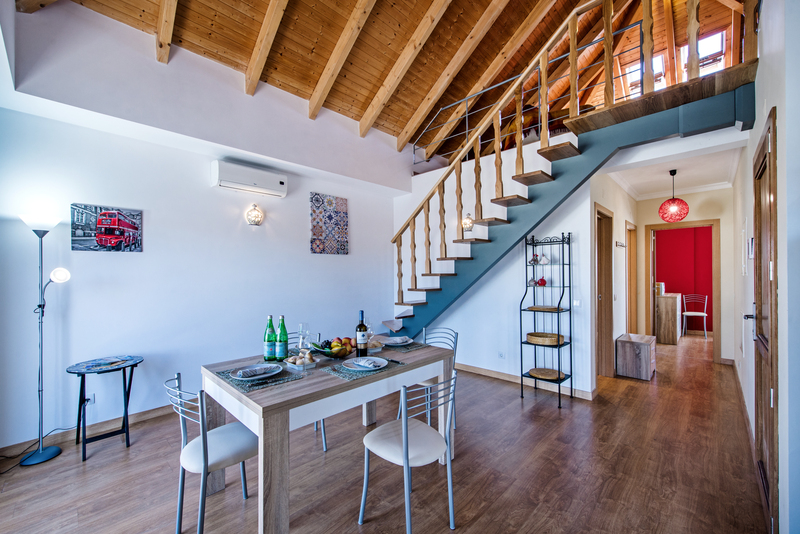 Against the back wall of the living room in our 2 bedroom apartment is an open decorative metal and wooden staircase that leads to a mezzanine floor that offers a wonderful and relaxing space. This space offers a comfortable sofa facing a large flat screen television which sits and a purpose built tv unit that matches the furniture on the first level to keep the theme of the 2 bedroom town centre apartment nice and modern. In the centre of the mezzanine is also a matching coffee table. 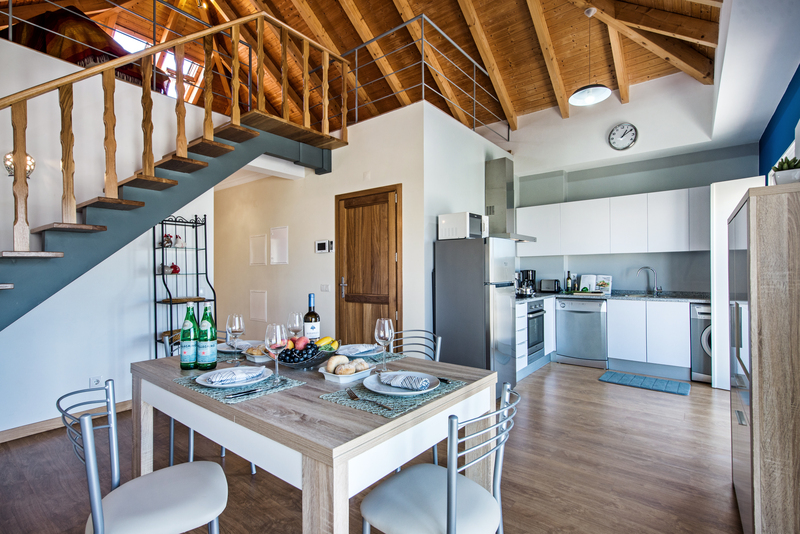 The mezzanine is wonderful clam and relaxing place and the light wooden flooring, white walls and wooden alcoved ceiling offers a really warm and comfortable living space to enjoy. The living space is open plan in our 2 bedroom 1st floor town centre apartment. The lower level is in an L shape style and next to the living area with the dining space is the kitchen. It is a very modern fitted design with modern and practical appliances. Fitted across 2 walls also in an L shape the space offers plenty of work tops and cupboards. The kitchen is styled in chrome and white with the integral appliances in chrome and the cupboards in white with smart great marble worktop. 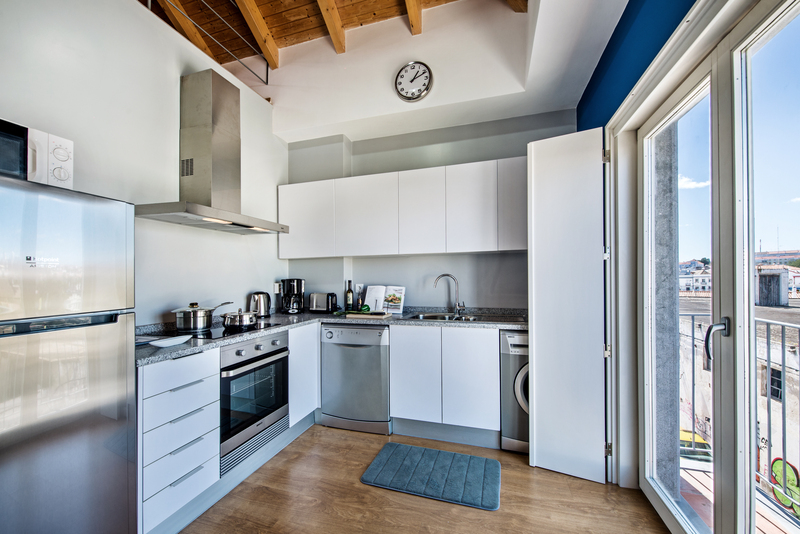 Fitted appliances include a full size fridge freezer, washing machine, dishwasher and electric oven. The hob is an electric ceramic hop and above is an inox extractor. The sink is aluminium with a swan neck mixer tap keeping in vogue with the kitchen style. We have made sure that small appliances have been thought of too and we have provided a kettle, toaster, capsule coffee machine and microwave. Tucked away in the cupboards is a huge selections of pots and pans, cooking and serving dishes, cutlery, cooking utensils and crockery. You will also find a wonderful selection of cups and mugs along with different style glasses to use. The second set of french windows with the Juliet balcony overlook the kitchen area so perfectly located to keep the are nice and cool and aired wilt cooking up a storm! From the front door the bedrooms and bathroom are to the right of the apartment and at the back. A small hallway leads to the bedrooms and on the left the first room is the family bathroom. 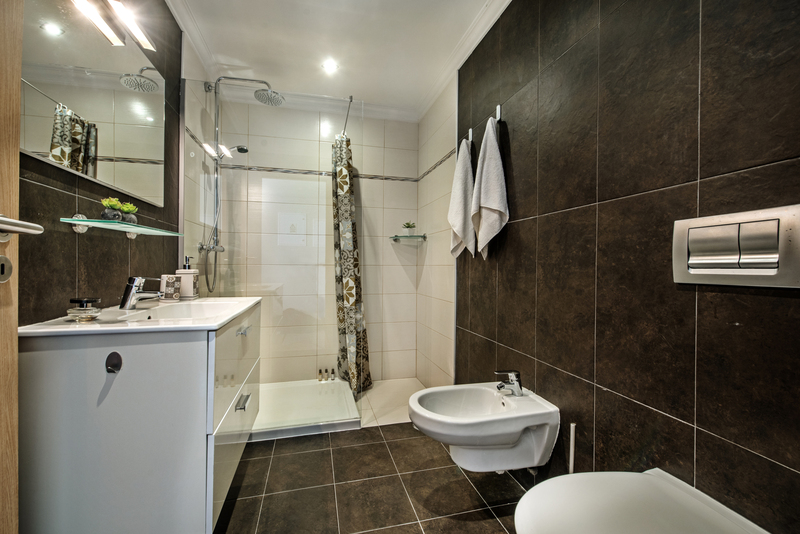 The bathroom is an ultra modern space in smart dark brown and cream wall tiles long with warm chocolate brown floor tiles making it a super clean and functional space. The suite includes white ceramic toilet and bidet, white ceramic basin set into a modern white vanity unit with storage space below and a large mirror above. A small smoked glass help offers the perfect place for cosmetics and toiletries. To the end of the bathroom is the shower with a great rainforest shower and plenty of space to enjoy the rainforest effect. To the left is the master bedroom of our 2 bedroom town centre apartment. The bedroom offers a large kingsize bed with a modern white lacquer headboard and matching white bedside cupboard with drawer space below. On each table is a simple but effective bedside lamp, a perfect light for reading. 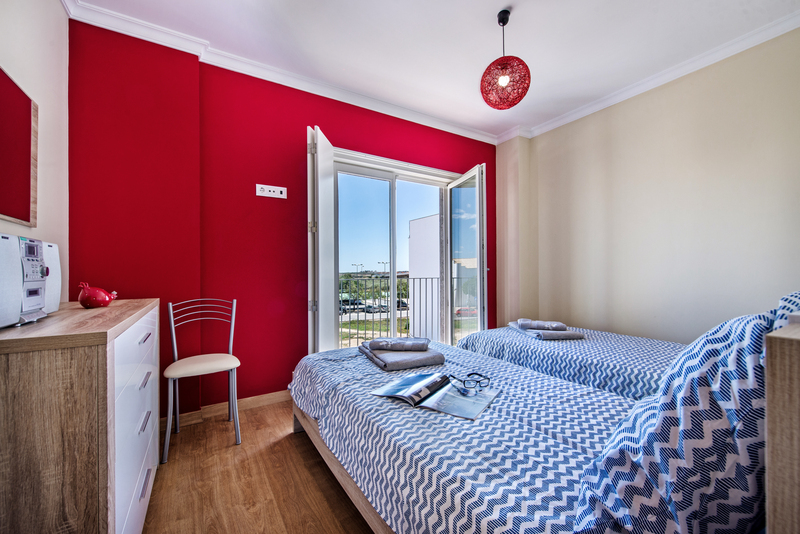 The outside wall is painted a contrasting red that adds vibrancy and interest to the bedroom. Huge french windows with bi folding doors open on to a small Juliet balcony that over looks a small cleared area often used by the older folk on Sundays to play boules. Against the inner wall is large fitted wardrobes with white sliding doors. They offer an abundance of storage for both bedrooms. You will find drawers, shelves and plenty of hanging space. 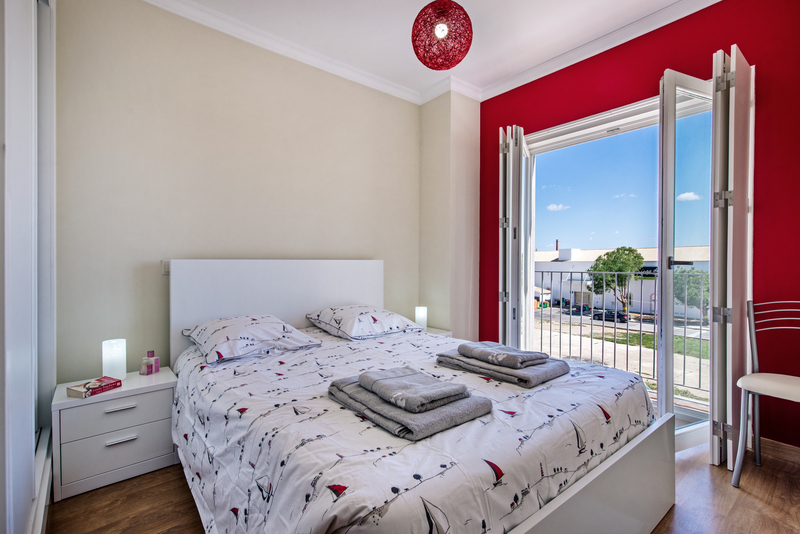 The master bedroom has an air conditioning unit that can be used to offer either cool fresh air in the summer months or cosy warm air in the slightly cooler winter months. The second bedroom is laid out with 2 single beds. Both with matching white and light wood headboards and a chest of drawers in the sam style that also matches the furniture in the living room. This means a nice constant modern theme runs through the whole of this 2 bedroom town centre apartment. Between the beds is a bed side unit with a lamp offering a reading light. The beds face towards the french windows again with bi folding doors that again look out over the boules area and on to the river Gilao that runs through the centre of Tavira and towards the wonderful Tavira island beaches. A wall painted in bright red again makes a wonderful contrast to the bedroom. Air conditioning is on offer and in both bedrooms shutters can be used to either cool the rooms during the summer or block out the light for nice morning lazy lay ins. The living space and bedrooms in this 2 bedroom town centre apartment all have small decorative Juliet balconies. 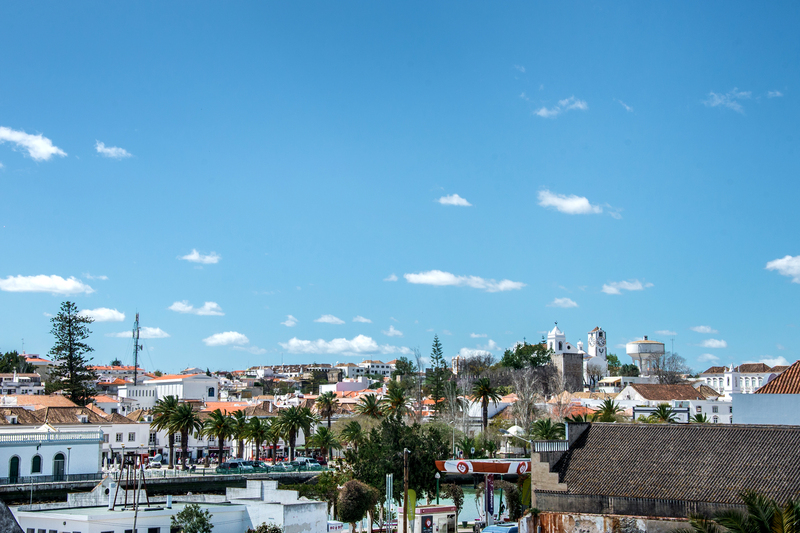 and from inside the apartment they offer a variety of views across the wonderful Roman City of Tavira and the beautiful River Gilao that makes Tavira such a wonderful place to enjoy. Apartment Vista Gilao is a simply gorgeous 2 bedroom apartment located right in the heart of Tavira. Its location is fabulous for those who wish to explore the City and enjoy the mix of attractions, history and tours on offer. 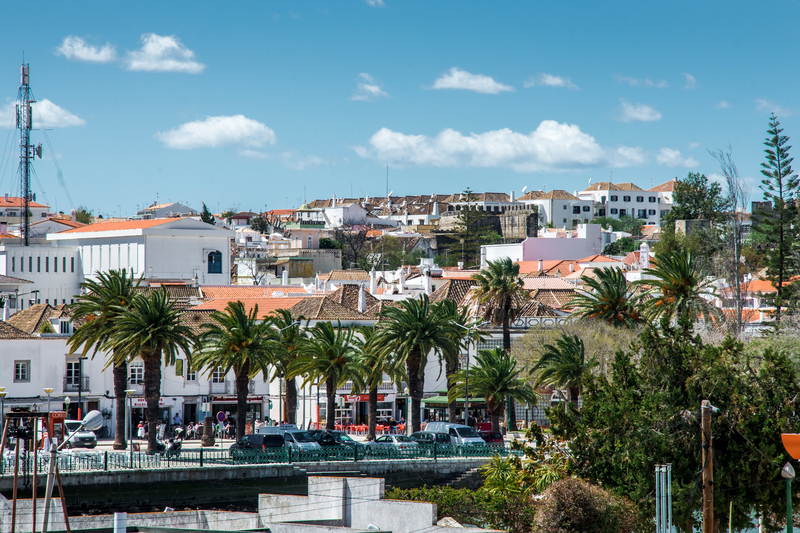 Tavira offers an amazing selection of fantastic places to eat and drink either beside the river Gilao or in the centre where you can watch the residents go about their days. Being so central there is no need to hire a car but both scooters and bicycles are readily available to hire. There is easy access to the island beach via a boat caught from the river Gilao. Our 2 bedroom town centre apartment is exceptionally well equipped to provide comfortable and modern accommodation with modern facilities, whilst still being in a historic building and location. Our lovely 2 bedroom town centre apartment comes with its own manual that you can download to your tablet or smart phone. Packed full of information to make the best of your holiday starting from the moment you arrive. It tells you how to collect the keys, who will look after you during your stay and clear concise directions to Apartment Vista Gilao. Then it is packed full with details of the best restaurants, taxis and local amenities and activities. Claudia de Mars Algarve fue muy agradable. Recomendable al 100%. "El apartamento es tal y como aparece en las fotografías. Tiene todas las comodidades y está todo muy nuevo. Pese a estar en una calle donde hay algún edificio vacío y medio en ruinas, la ubicación es muy buena y parece segura, a un solo paso del río. 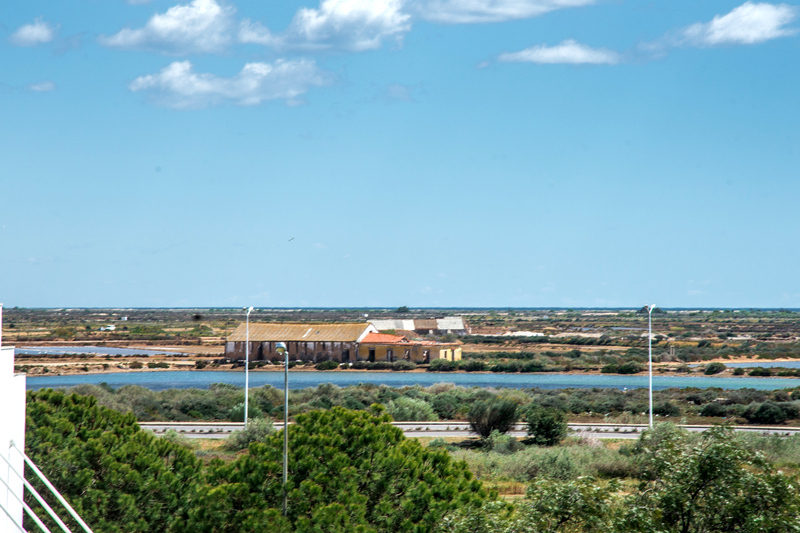 Nuestra estancia ha sido fantástica en este lugar, así que lo recomiendo al 100%"
"Apartamento con todas las comodidades. Todo muy nuevo. Menaje de cocina completísimo. Claudia de Mars Algarve fue muy agradable. Recomendable al 100%." Top service, top apartment. A bit noisy with morning supermarket delivery, but where is Tavira not loud in the morning? All in all, very good, including the friendly and helpful care by the staff. We'll be back! 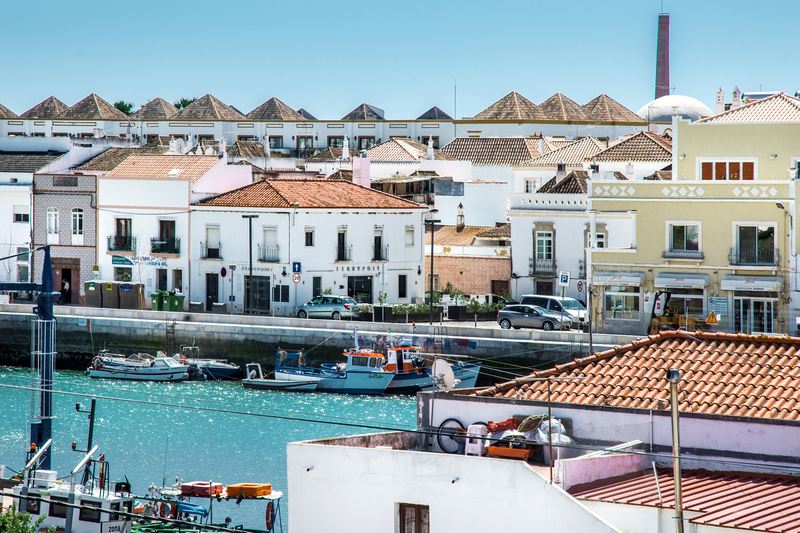 "I would highly recommend staying with this host - the check in was seamless and the flat itself is lovely and well appointed, and is well located in Tavira." "Thanks for the great trip, we all really enjoyed our stay!" 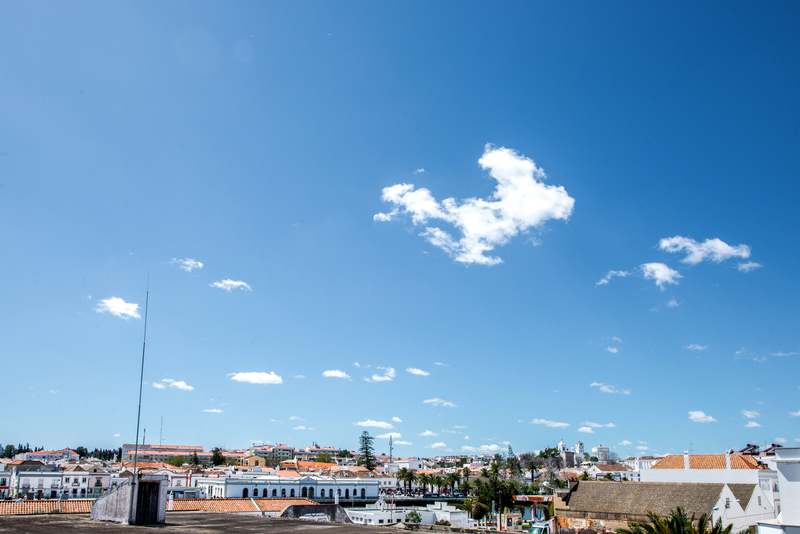 We enjoyed our time in Tavira very much, and we’re also very satisfied with the apartment! Everything was absolutely fantastic. 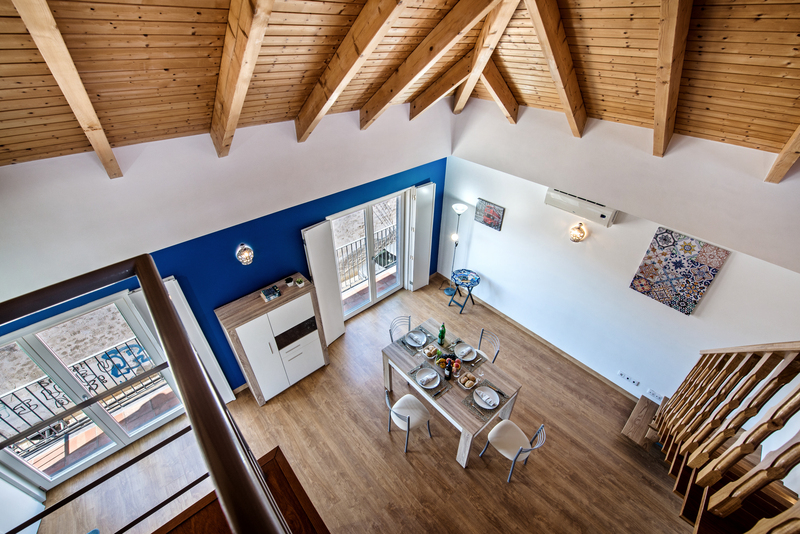 Well equipped apartment with comfortable beds and enough space for 4 people. The Mars team were so helpful . Big thank you to all. Loved our time here. Great place to stay in a lovely city. The apartment was spotless and in the ideal location - peaceful but near the restaurants and with a supermarket a hundred metres away - the welcome and information were excellent and we plan to return soon. 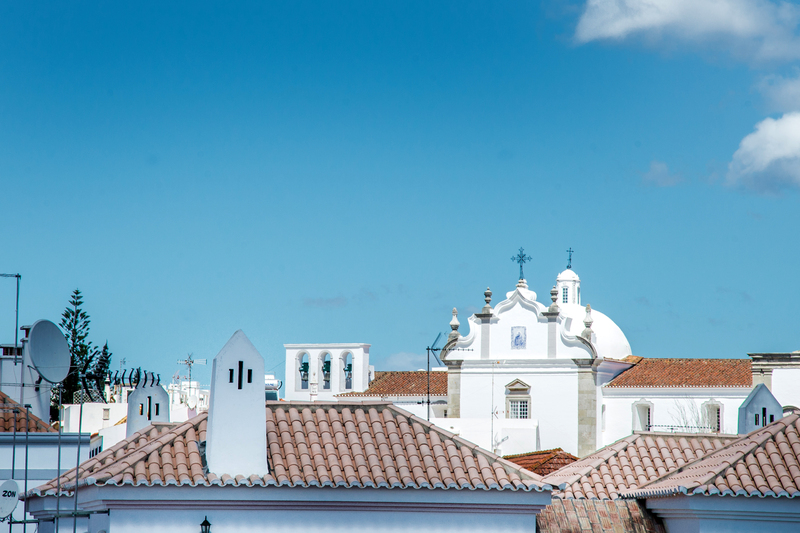 Tavira is a friendly place with things to suit most tastes and a lovely laid-back atmosphere. Birdwatchers paradise. This is a wonderful location and a really lovely apartment! A great apartment in a great location. The kitchen was well stocked with equipment for us to make brekkie every morning, and being just round the corner from a supermarket was a godsend. The apartment is clean, and although the views aren't great the location more than made up for it. Walking distance to the centre of town and 10 mins from the ferry. A perfect base. The communication leading up to and whilst away were perfect. Our flight was severely delayed, but it was made to be made no big deal by the hosts which certainly took and element of the stress away! I would definitely recommend this place for someone a base in central Tavira. We loved it. The apartment was exactly as shown and discribed on the webpage. Our hosts we waiting for us when we arrived and spent time with us explaining the use of appliances and about the area. 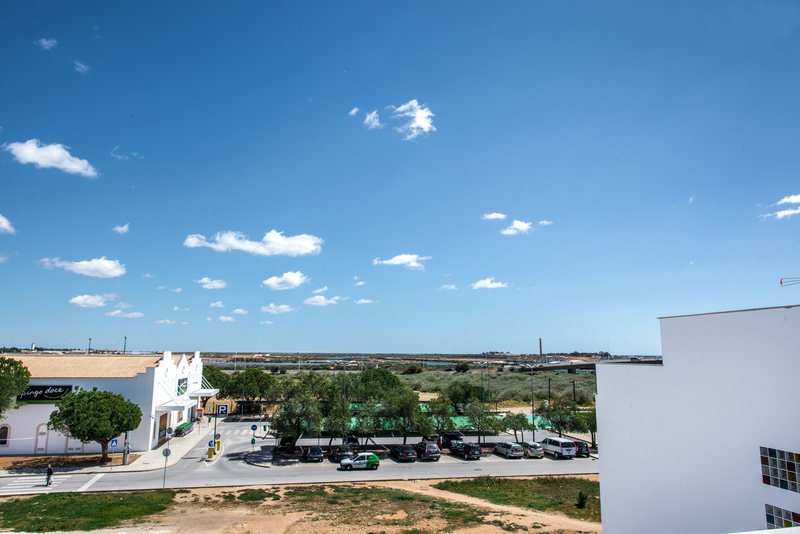 There is a grocery store less than a block away which is very convenient and it is a short walk to the center of town, if we are in Tavira again we would definitely stay there again. Friendly host upon arrival. Location excellent as described. Close to beautiful town . All facilities excellent in appt . The apartment was beautiful, clean and well appointed with everything we needed during our stay. 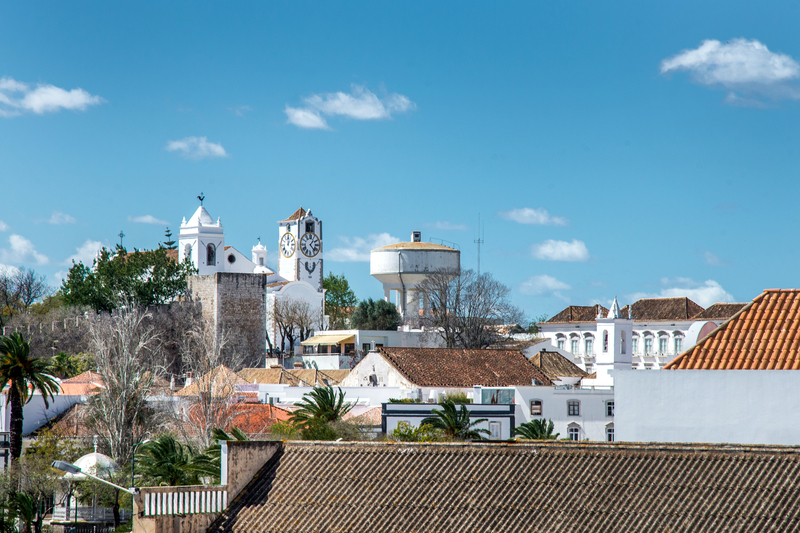 The location couldn't have been better; it is within walking distance to pretty much all the cafes and restaurants in Tavira and there is a supermarket, Pingo Doce, literally a stones throw away. Our host who met us when we arrived was very friendly and gave us valuable advice regarding the local area. Overall, these things added up to a very relaxing and enjoyable holiday and we would definitely stay here again.